I faced an error “No supported compiler or SDK was found.” when I tried to compile mexlised cpp file on MATLAB2015a (Mac 10.10.5). MATLAB complains as fellow when “mex -setup” command is issued. “No supported compiler or SDK was found.” which means that either no compiler has been installed on your system or not properly been linked with MATLAB’s mex. The following link worked for my case and I could successfully compile mexlised cpp files. Hope this save some your time. This entry was posted in Apple, Mac OS, MATLAB and tagged MAC, MATLAB, Mex on November 18, 2015 by enddl22. XtraFinder, Awesome tool for adding useful features to Finder. I have been looking for a way of adding a menu of “create a new text file” by just one right click on Mac (Yosemite). It is similar to a function what Windows already has but not for Mac. In order to create a blank text file, that is very common when you are using PC, I need to open a text editor and put some text in the file and save it to the path you want. This takes time and annoying sometimes when your path is a bit complicated. Here is a workaround. XtraFinder will do all these things for you. 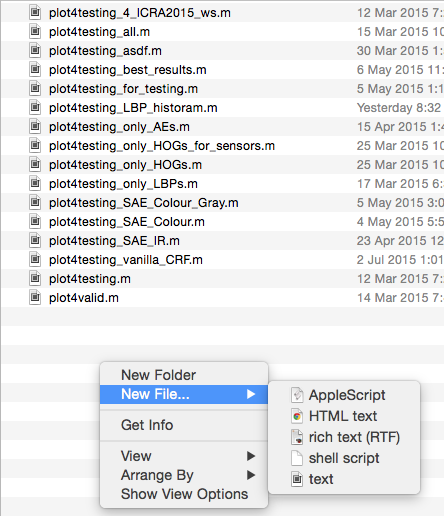 All what you need to do is just install file and one click “New file” in Add items to Finder menus tab. It is a free software and no limitations as far as know. This entry was posted in Apple, Mac OS and tagged Add new file, MAC, XtraFinder on July 6, 2015 by enddl22. How to edit text in Keynote 6 including super-, subscription. Some fonts include ligatures, a decorative joining of two characters to form a single typographic character. You can use ligatures if the font you’re using supports them. In addition to ligatures, you can make other adjustments to the spacing between characters, and change the spacing of text in relation to other text. In the Text pane of the Format inspector, click the Style button. In the Font section, click , then choose an item in the Ligatures pop-up menu. Use Default: Uses a subset of ligatures for the font. Use None: Uses regular spacing with no ligatures for the font. Use All: Uses all available ligatures for the font. To remove ligatures from selected text, choose “Use None” from the Ligatures pop-up menu. Select the text box you want to change. In the Font section, click , then use the arrows to change the Character Spacing value. The default spacing is zero. Increasing the value widens the spacing, and decreasing the value tightens it. Selecting a text box applies the spacing to all of the text in the text box as well as any text you enter in the text box after you apply the change. If you select specific text, your setting affects only the selected text, so any new text you enter won’t be spaced the same way. If you want other text in the presentation to use the same settings, you can define a new paragraph style from your selection, then use that style for other text in your presentation. You can adjust the baseline of characters to make them superscript or subscript. A trademark symbol, for example, is raised above the trademarked term (superscript). In a chemical formula, the number of atoms is lowered below the symbol of the atom (subscript). In Keynote, you can quickly apply a default superscript or subscript to selected text, or you can tweak the baseline of selected text by small increments. Select the text you want to make superscript or subscript. In the Font section, click , then choose Superscript or Subscript from the Baseline pop-up menu. To adjust the placement, use the arrows to change the Baseline Shift value. This entry was posted in Apple, Mac OS and tagged keynote, MAC, subscript, text on May 8, 2015 by enddl22.